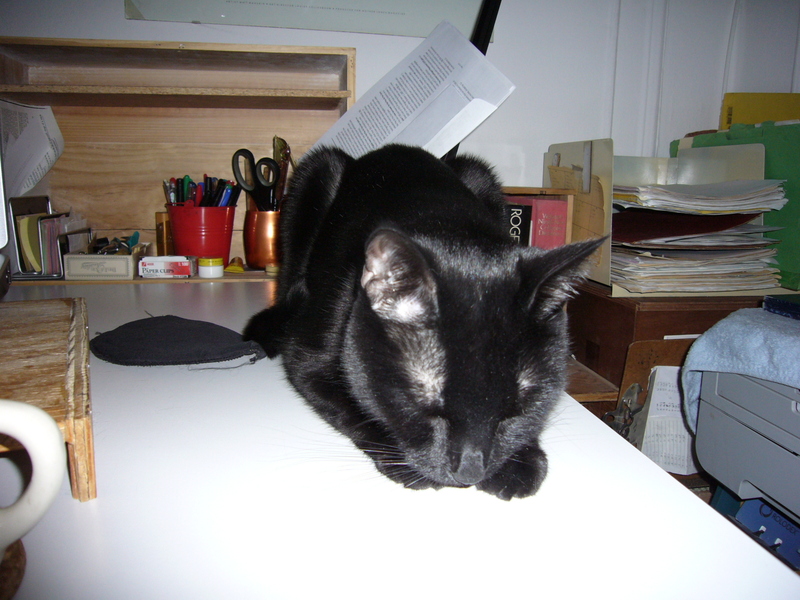 When I was a kid I remember a poster of a black cat on a cement sidewalk. “City Cat”, I think, was the title. 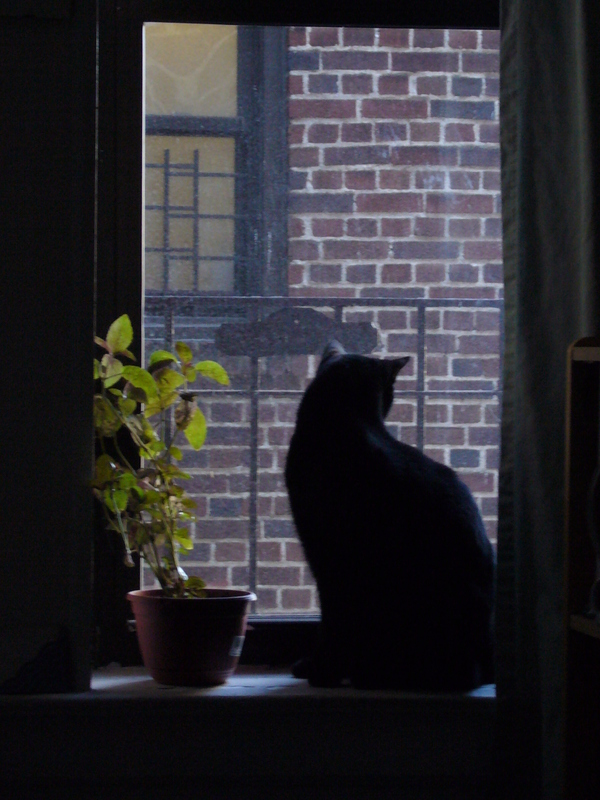 A variation on a theme: “Windowsill Cat”. Annoyed that she is no longer sleeping. 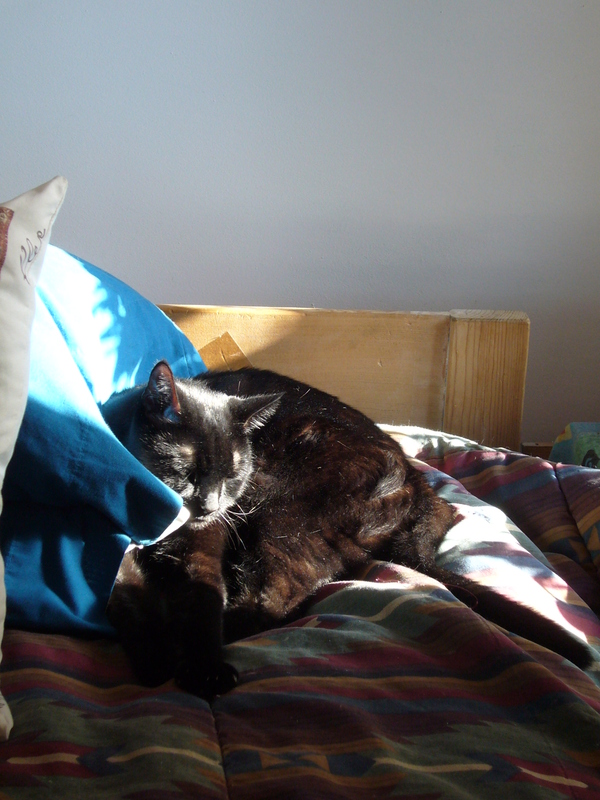 On the bed in the sun. 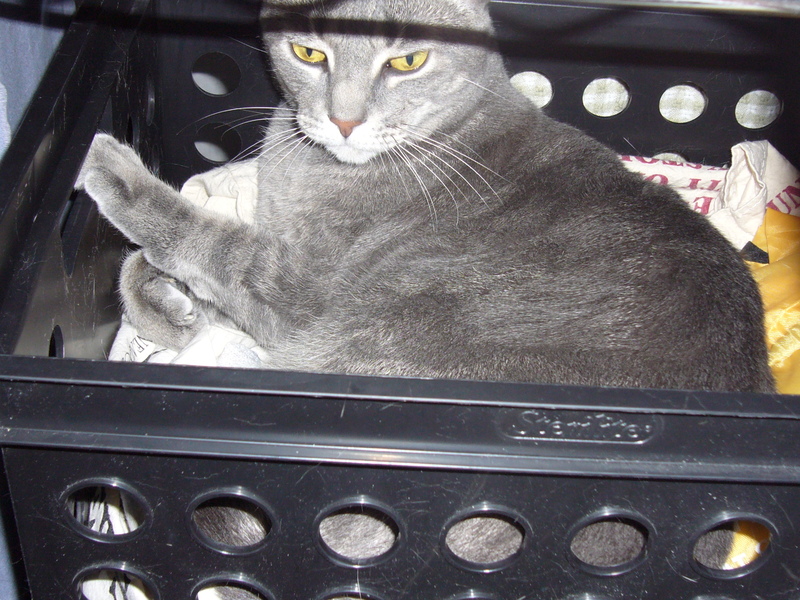 In a file box on my socks. Again, annoyed I woke her up. 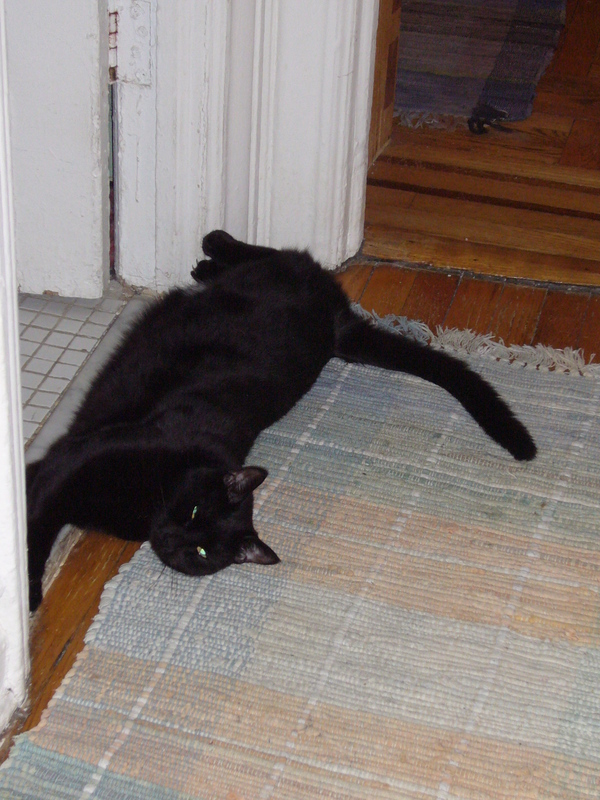 At the threshold to the bathroom. These are not the only places the cats sleep. No, these cats are pros, and can sleep anywhere. You might think this story were from The Onion. You would be wrong. When their new $70,000 princess-themed playroom is finished in March, Stella, 4 years old, and Presley, 2½, will have a faux gem-encrusted performance stage, a treehouse loft, and a mini-French cafe. A $20,000 custom carpet with colorful pathways will lead the girls to the various play areas. “It’s going to be a pink explosion, with hearts and bows and crowns and tassels,” says their mother, Lindsay Dickhout, chief executive of a company that makes tanning products. The playroom will occupy about 1,500 square feet on the ground floor of the family’s 7,000-square foot home in Newport Beach, Calif.
I’d like to note that my apartment is about 400 square feet. I’d also like to note that if I could afford it, I’d love a bigger place (my id: MORE SPACE! MORE SPACE! MORE SPACE!) but 1500 sq feet seems extravagant (not that I’d turn that down, mind you. . .) and 7000, well, that might as well be 70,000. Jeez. Dahlia Mahmood, whose company Dahlia Designs has offices in Los Angeles and Ashburn, Va., created a $200,000 princess-fairy themed room for a 2-year-old girl in Virginia five years ago. She built a castle-shaped bed with turrets in which all the girl’s princess dolls could be stored. The room has its own entrance with a tiny door, too small for adults but just right for the little girl. Hand-painted bathroom walls were accented with Swarovski crystals. When the girl turned 4, Ms. Mahmood returned to the project and redesigned the room, removing portions of the castle, expanding the bed to full size and installing two large, molded, fiberglass trees outfitted with twinkle lights, she said. While the family was out of their Millstone Township, N.J., home, Ms. Blum Schuchart went in and installed the “royal prince nursery.” The room, which Ms. Urs estimated cost between $15,000 and $18,000, included a crib with blue satin ribbons, a Rococo-style dresser painted in silvery-gold and elaborate tufted blue curtains. The family saw the room for the first time when they came home from the hospital with their new baby, Luke. “The boy’s room is very regal. I’ll be heartbroken when Luke wants it to be a big-boy Dallas Cowboys room,” despite her love for the team, Ms. Urs said. Some companies say that when it comes to princess décor, Marie Antoinette-level pricing works best. PoshTots, a Chesapeake, Va.-based online retailer of children’s furniture, sells expensive items including $35,000 princess carriage beds. A few years ago, the company introduced a $3,900 princess bed in the hope it would find more customers than the company’s nearly $10,000 option. But sales of the cheaper product were a dud. “If our customer wants to go princess, they’ll go for the $10,000 bed,” said Andrea Edmunds, PoshTots’ director of marketing. I can go long stretches with a routine or an arrangement, and then. . . I get antsy. I toss things out, put some stuff into storage and pull other stuff out, and I move. That used to be literal: Between college and the latter years of grad school, I moved on average of more than once a year. There was that first year in grad school, with the screechy-horrid roommate who accused me of lying to her about. . . something, whereupon I decamped to a horrid, horrid apartment about 2 miles west on Franklin Avenue for a couple months. Then the woman who replaced me and the decent roommate kicked out the screechy-horror after she threw their kittens out of the apartment—they found tracks in the snow, but not the kitties—an invited me back in. Oh, and there was Albuquerque, and that basement apartment that I had to leave after a week or two, into a room in the house of that nice, soft-spoken woman who turned out to be psycho when she wasn’t being nice and soft-spoken, then the duplex around the corner which my ABQ-cat Jomo broke out of with some regularity. One place in Montreal, one in Somerville, then sublet in Prospect Heights, room in Clinton Hill, apartment in Bushwick, room in Bed Stuy, and then, finally, my own place, in lovely Prospect- Lefferts Garden. And this apartment is fine, it really is. I’d like a bigger place, but, for now, with my finances, this joint works out fine. Still, I get antsy, and since I’m in no position to move, I move. . . my furniture. It’s tough—small place, remember?—but I can shift around my desk and various wine-box shelves and swap out rugs. Can’t really do much with the bedroom: four bookshelves line the back wall, and while I have moved my bed NSE and W in the same position, it really only works where it is now (headboard south). Anyway, I’m sitting in my living room watching Eureka (fourth season—new episodes for me) and thinking, Huh, I’d really like to change things up. But how? I’ve tried this and that and the other thing and, really, the way I had it was probably the best way. So I tried something else, that I hadn’t tried before. I don’t know if it’ll work, but, y’know, it’s the summer and I was antsy and I wanted to move and so I did. And maybe, someday, my stuff, my cats, and me, into a larger place where I have many—or at least, some—different ways of how to arrange it all. So I awoke to a great wailing and gnashing of teeth. . . no, wait, that’s not right. So I awoke to confused alarms of struggle and flight. . . no, no, that’s not it, either. 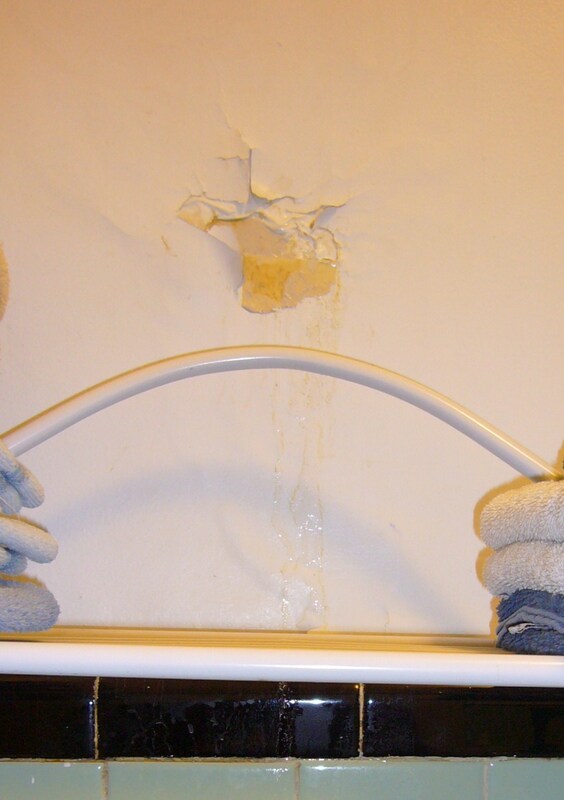 So I awoke to a sledgehammer pounding the plaster and tile in the apartment above. Ah, yes: that’s more like it. The cats noticed before I did (I always get nervous when they stare at the wall or ceiling, afraid of some fearsome bug), but before long the consequences of those odd, easily-ignored, noises became apparent. Don’t judge me: When you live in an old building, there are always odd noises. If you don’t learn to ignore them, you will spend all of your time tracking down the whys and wherefores. This, however, could not be ignored. Friday night it was just the living room wall, but by Saturday, the other side of the wall, in the bathroom, was pooching out. 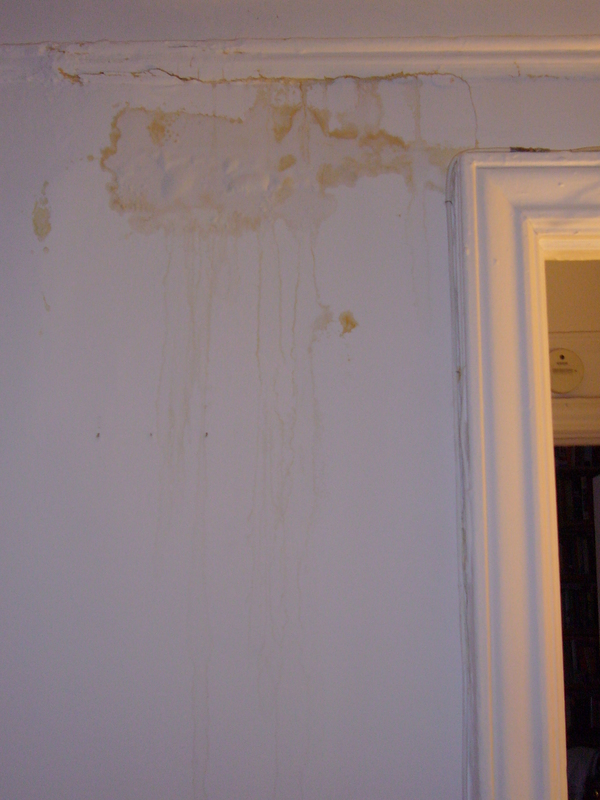 The living room wall looked bad, but there wasn’t too much water; the bathroom wall, however, was rather too weepy. Two keys to this, of course: One, the cap (which, unlike the recyclable jug, had to be dug out of the trash), and two, the tape. 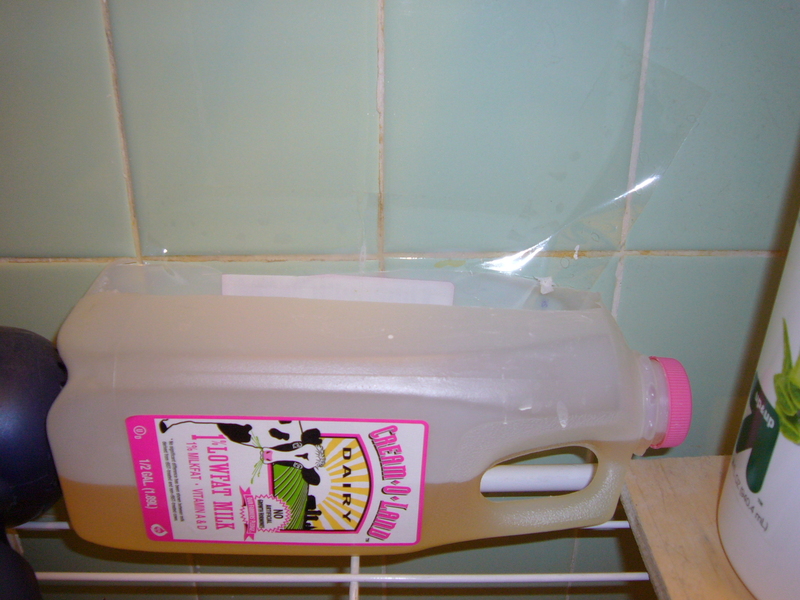 The water would just have dripped behind the plastic had it not been given a slide from the tile into the jug. Luckily, the drip path didn’t follow the grout line, so the tape held its own. (And no, that’s not sewage in the jug; the water was colored by whatever is in the wall. Anyway, the super was up bright and early smashing walls for the plumber, and they’re now up there stomping and clanging and scaring the hell out of my cats and, hopefully, putting an end to the source of the walls’ agonies. So, yep, it’s Tuesday. The first Tuesday in November. The first Tuesday in November in an even-numbered year. I’m celebrating the first Tuesday in November in an even-numbered year by painting my desk. Actually, the desk was a table before I put a computer and a bunch of books on it. I bought it when I lived in Somerville and had a HUGE kitchen—and was still under the delusion that I might someday have lots and lots of friends in the Boston area and we’d all congregate regularly in my gorgeous apartment with its HUGE kitchen. Anyway. 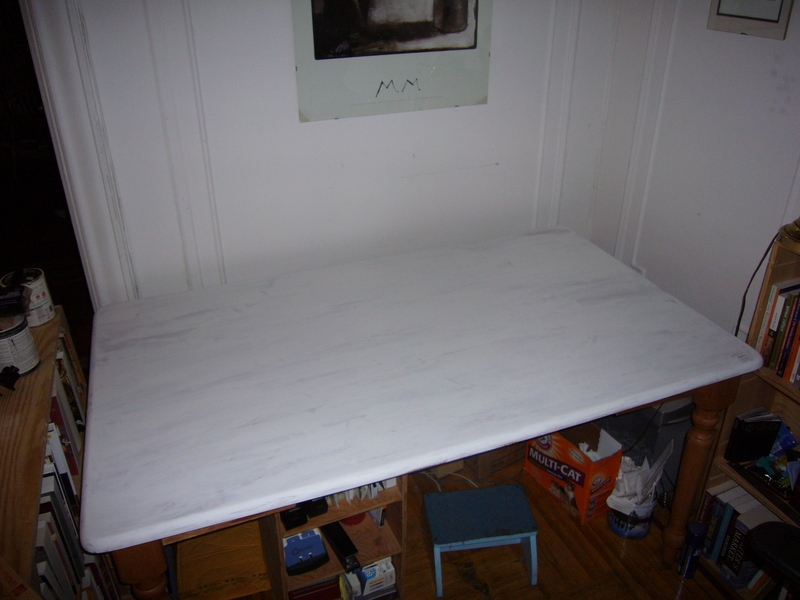 It was sometimes stored and sometimes used as a table in New York, and after I failed to sell it, I figured I’d bring it with me to this apartment and use it as a desk. It’s fine as a desk. The height’s a bit awkward vis-a-vis the arms on my chair, but that’s manageable. The truly great thing about it is that I can store a bunch of office-related stuff underneath it and out of site. But the color, sigh, the color. I had stained it lo those many years ago, and was never happy with the stain. I was going for something warm and not too dark; I ended up with. . . orange. Well, not orange exactly, but definitely orange-ish. I ougtta paint it, I thought. Then the thought would come around again: I oughtta paint it. And nothing. It’s really dark in that corner; painting the desk would really lighten things up. Nothing. But now! This first Tuesday of November in an even-numbered year and when I am only half-employed—now would be a fine time to paint it! 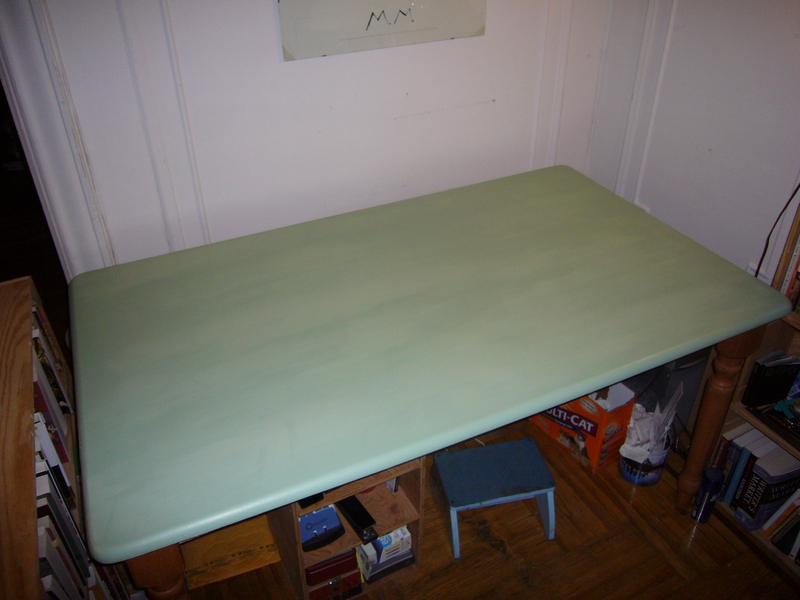 So when I got home from my very slow run through Prospect Park, I sanded down the top and primed it. Ta da! Terribly exciting, I know. Almost as exciting as creating a large space of wetness with two kitties around. I’m going for something very light green—not mint (flashback to bad bridesmaid dresses)—but more olive or apple-y. I’ll see what I can manage with the paint I have. It’s not yet dry, and I intentionally didn’t mix it thoroughly, so it’s a bit streaky. If I can keep the cats off it for the next half hour or so, it should be fine. So that’s what I did on the night of the first Tuesday in November in an even-numbered year. I finally did it: I got rid of my t.v. I’d been going back and forth on this decision ever since I moved in January. I didn’t have access to my t.v. at my previous apartment, but in my new space, well, I’d see what I could get with just an antennae. Bupkis, is what I could get. So I didn’t watch it, but I kept it around, thinking that maybe I’ll join Netflix and watch some movies. But I never got around to doing that, and I wasn’t sure I wanted to shell out the 100 bucks for a Roku box anyway, and then my DVD player decided everything looked better in black and white. . . and this big lump of plastic, wire, and various toxic material didn’t seem to be worth it. What really tipped me over, however, were my ongoing and heretofore unsuccessful attempts to transform my main space into a way that, mmm, flowed. It didn’t flow, and moving around chairs and shelves and the t.v. just didn’t cut it. But: If I got rid of the t.v., I could move this over there and that over here and voila! flow! So that’s what I did. I put the t.v. (with its remote, instructions, and original box, of course) in the hall, posted a few signs in my building that a free working t.v. was available for the taking and voila! taken! Please note that I am not proffering any sort of anti-television purity. I greatly enjoyed watching trashy cable shows with my old roommate P., and were I not so cheap, I might have sprung for cable on my own. But it’s also true that I watched very little first-run t.v., far more often plunking myself down in front of the tube for a marathon of Law & Orders or CSIs, or watching Independence Day (i.e., Doritos-on-film) for the eleventy millionth time. After my initial withdrawal symptoms passed, I realized that I really could live without t.v. Especially when there’s Hulu. . . .